Mrs. Bernice Taylor Franklin of Ponca City has gone to heaven. She was 97 years young. Funeral services will begin at 2 o’clock in the afternoon on April 20, 2019 at Grace Memorial Chapel in Ponca City. Burial will follow at Resthaven Cemetery also in Ponca. The reverend Thomas L. Webb will officiate. Casket bearers for the service will include Jimmy Roland, Brian Franklin, Terry Franklin, Adrian Wallace, Chris Wallace, and William Johnson. Friends are welcome to pay their respects at the funeral home on Wednesday, Thursday, and Friday from 8 a.m. until 8 p.m.
She was born to K.D. and Elanora Taylor on March 14, 1922 and raised in Hennepin, Oklahoma. She attended school In Winnewood and Hennepin. When she was 19, she met and married the love of her life, Hiarm Franklin and they moved to Lawton, OK. The couple raised 5 daughters and one son in Ponca City where she worked as a housecleaner. She enjoyed sewing and making quilts, her hands were rarely still. She made beautiful baby quilts. She was an avid gardener, enjoyed cooking and loved life. She enjoyed playing dominos daily. 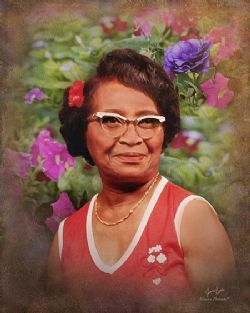 She leaves behind to cherish her memory her daughters Dorothy Alexander, Odell Wallace Ozell Calvert, Shirley Ann Langham and her husband Herbert, and Pearly Roland and her husband James, 18 grandchildren, a host of great grandchildren, sister Wernice Connley and her husband Clem, and sister Opal Calvert. She was reunited in heaven with her parents, former husband Hiarm Franklin, son Hiarm Franklin, Jr., great-great granddaughter Elizabeth Rose, five brothers Melvin Taylor, Leonard Taylor, Mose Taylor, James Taylor and Mitchell Taylor, two sisters Mercedes Taylor and Rosie Taylor. She was a kind and gracious woman who always had a smile on her face. All who knew Bernice loved her. We will forever miss her.